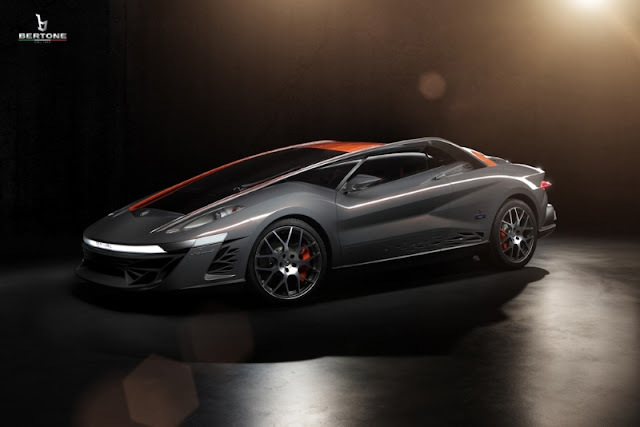 Bertone celebrates its centennial by presenting the world premiere of Nuccio, an extreme sports car “concept”. The Nuccio is the new “object of desire” in the international luxury market, a symbol of Italy for the lucky collector who will own this absolute expression of Italian lifestyle and car design. 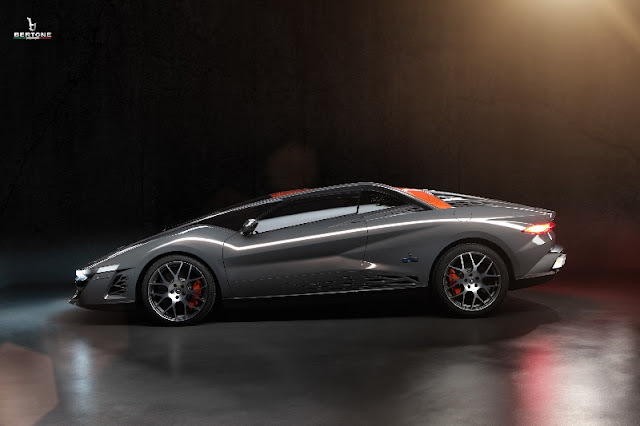 The Nuccio has classic Bertone supercar proportions, expressed in its’ low, muscular body (length 4800 mm, width 1950 mm, height 1220 mm), which coherently recalls some of Bertones’ historical masterpieces: the Alfa Romeo Carabo (1968), the Lancia Stratos Zero (1970) and the Lamborghini Countach (1971). However, the Nuccio transforms the easily recognizable Bertone DNA and projects its form language strongly into a future dimension. Choosing the Nuccio means choosing an ultra-exclusive automobile. The one-off prototype is the only one in the world, entirely constructed by hand, in true Italian-style, like the great sports cars that have marked the history of the automobile, enhancing the personality of the collector and the connoisseur capable of appreciating exceptional style combined with extreme performance. The Nuccio is an ultimate expression of custom-built, produced in a single example for an extraordinary event such as the Bertone Centennial celebration. Its intrinsic value goes well beyond a simple status symbol. The Nuccio is the most advanced expression of Italian style, a work of art in motion, as a milestone in the history of car design. The Nuccio expresses the modern “cab forward” concept, a passenger cabin which has been pushed forward due to the position of the mid-engine, invented by Bertone in 1967 with the Carabo, then refined in 1970 with the Stratos Zero, and finally put into production in 1973 with the Lamborghini Countach. “Cab forward” architecture means the interior of the car is moved forward to make room for the midship engine, integrating the windscreen and bonnet into a single volume. The wedge-shaped bodyside on the Nuccio is characterized by a clever interplay of concave and convex volumes which generate visual muscle tension. The figurative element of greater appeal to the Stratos Zero is by far the largest windshield tapered shape, slightly trapezoidal. 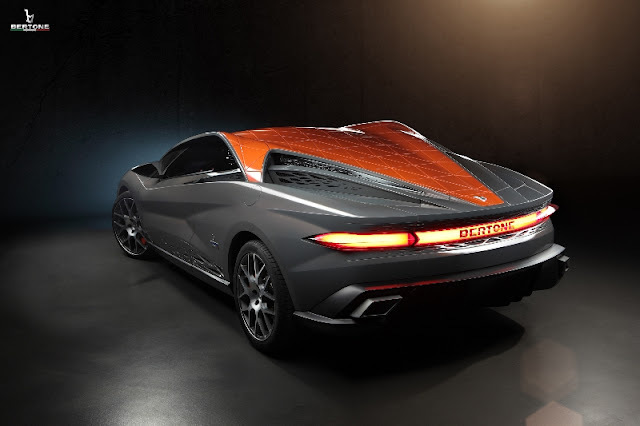 This choice of structure has given rise to a solution amazing graphics, which the two outer ribs that framing the windshield, giving rise to go up two side extensions in matching side vents, such as the back of an athlete ready to spring on starting block. 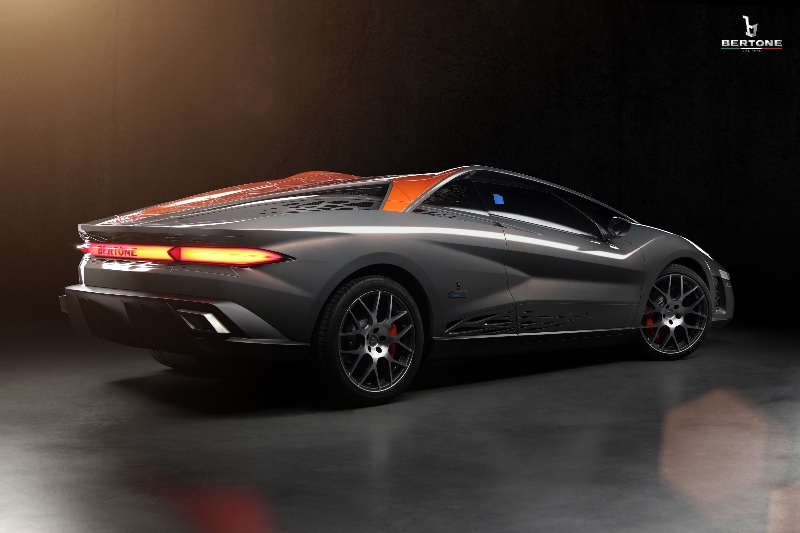 The side view reveals the “twin peaks” typical of Stratos Zero, reinterpreted with a futuristic feeling, inspired by avant-garde architecture, using technology tensile structure in an automobile for the first time, lighter and more robust than classic steel chassis’ based on the pillar and beam architecture. The rails on either side of the roof pull the transversal steel cables maintaining the system under tension. To underline this innovative solution, never seen before in the automotive world, the roof was painted bright orange. The headlights and taillights are positioned in thin horizontal “light bars” which extend across the entire width of the front and the rear of the car. The Nuccio also shows innovation in active safety, with a patented front brake light. When the car is braking, the intensity of the white, front DRL (Daytime Running Lights) increases, so pedestrians will recognize if the vehicle is slowing down, even in the front view. Should this innovation be accepted in the near future by European Transportation authorities, all cars will obligatorily have front brake lights, raising the bar in automotive safety. The interior of the Nuccio was designed with exclusive elegance, a distinctive style typical of true custom-built, one-off prototypes intended for an audience of sophisticated collectors. The classic supercar layout starts from the powerful center console armrest which climbs up towards the instrument panel in an inclined plane where all the controls (climate, radio, etc.) are positioned. The red “start / stop” button is featured in the very center of the console. 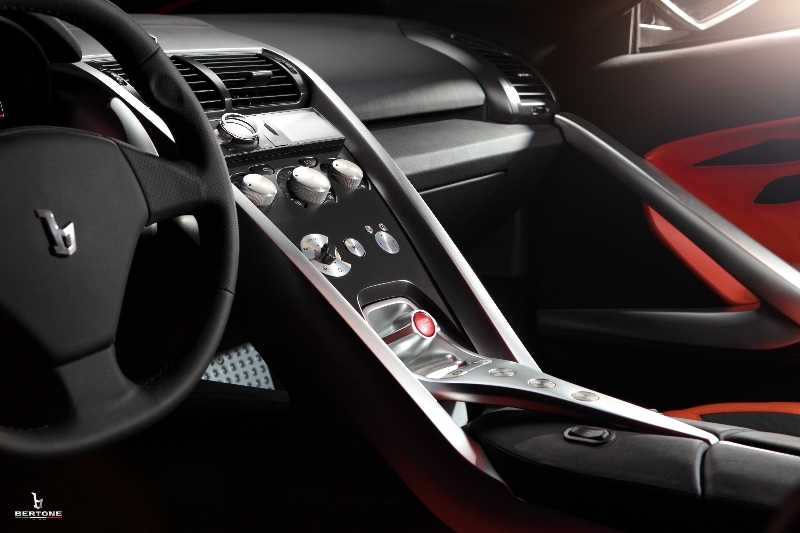 The automatic “triptronic” gearshift levers are located to the left and right of the steering column, allowing the traditional shift lever on the center console to be eliminated. The instruments are analog with a large central tachometer, typical of extreme sports cars, all done in the same color as the car, anthracite gray and orange. 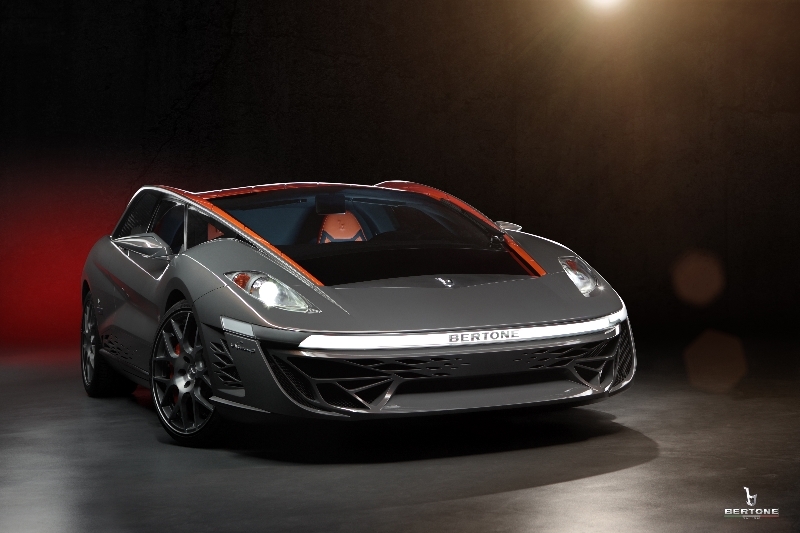 The anatomical, orange leather seats echo the two-tone exterior colors, with “virus-like” inserts in anthracite gray. Each passenger is protected not only by the anatomical seats that conform perfectly to the body thanks to an innovative cushion treatment, but also by the “Y-shaped” aluminum structures on the door panels and on the center console, protecting both sides of the passengers, designed to offer maximum side impact resistance inside the car. A range of highest quality accessories completes the Nuccio offering, confirming more than ever the new object of desire. Bertone has designed an exclusive, hand-made suitcase crafted with the same orange leather from the Nuccio seats, which fits in the front luggage compartment perfectly. And for the lucky collector who will purchase the car, Bertone has also designed two cashmere jackets customized with Nuccio graphics and the customers’ name, made by Lanificio Cerruti, the world renowned Italian stylist. Engine: 8 cylinders in V; 4,300 cm3, 480 hp.